This outdoor chalkboard pavement sign or A-board is perfect for shops and businesses which change their marketing message or prices regularly and want to increase the visibility of their premises… and do it all without breaking the bank! This chalk board A-frame is particularly popular with businesses such as cafes, restaurants, green grocers, butchers, fish shops and the like – basically any business which needs to change its marketing message regularly to match their changing offers. This A-frame black board sign or sidewalk sign is one of the cheapest on the market, yet is durable enough to withstand the rough treatment these signs can receive in busy public spaces. The sandwich board display is constructed from folded 3mm polystyrene plastic sheet, so it is completely weather-proof and weighs under 3.5kg, ensuring that it can be moved by any member of your staff. It also has an integrated hinge that allows the pavement chalkboard to fold flat to save space whilst it is not in use. Folding footpath signs have been a favourite means of advertising for retail businesses for years because they work. 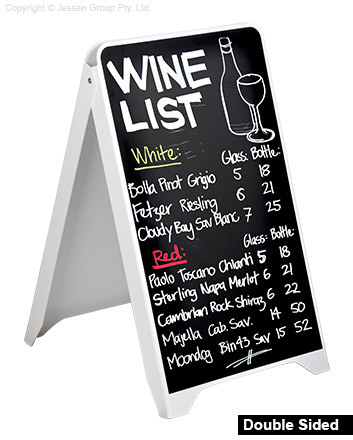 Simply by placing one of these folding chalkboards on the footpath near to your business you can increase your patronage and sales. We proudly stock the largest range of pavement signs and A-boards in Australia, so if this sign is not the right one for your business, head to our A-Frame Signs & Sandwich Boards page to find one that is!